As the Holy Empire rises to power, the neighboring lands begin to gradually fall under its control. The Empire's conquest eventually reaches the small island of Erin, home to the Gael tribe. There, a priestess named Riannon is kidnapped to be offered as a living sacrifice to the demon king Arawn, a malevolent being rumored to have caused untold destruction in the past. Riannon's brother, First Warrior Arthur, rescues her, when Arawn suddenly materializes before them as a handsome grey-haired man. Hiding his true identity and remaining enigmatic, Arawn pledges his power and leadership to the tribe's cause and joins Arthur, Riannon, and their merry band of friends—including a talented swordsman, an agile hunter, and a group of ecstatic pixies—as they fight back against the Empire, while uncovering the dark secrets of the land along the way. Episode 1 was pre-aired online on April 3rd. TV broadcast began on April 6th. Okay, now I will admit one thing here. I have been itching (that's right, itching), to review this series from around episode 6. There's very few shows that have that effect on me, and almost every one is a special case. This one is no different, not because the show is actually good, or because it's well animated, or even because it has a good soundtrack. I've been wanting to review this show because of the things that inspired it's creation, and by this I don't mean the eroge that came before (although admittedly this version is based on the PS3 remake). Instead, I mean the cultural, historical and mythological references that have been poured in, mixed around and served to the audience. If there's one thing that I've always loved about anime, it's the way that the creators take things that we know and turn them on their head. Sometimes it works, sometimes it doesn't, and sometimes ... the end result is just a little bit special. Tears to Tiara is a case in point. The series, as I've already mentioned, is based on the PS3 game of the same name. However, don't be fooled into thinking that the show loses points because of this. The producers have done a remarkable job in that, if you haven't heard of the original game, you would have no way of knowing that it's based on one. The story is set in a time very similar to the Dark Ages in Britain. A group of soldiers from the Divine Empire have come to a deserted village belonging to the Gael tribe. Their purpose is to take the priestess Rhiannon, who is also the chief's daughter, and use her as a sacrifice to resurrect the demon king Arawn. Rhiannon's brother Arthur senses something wrong and goes to rescue his sister. Tears to Tiara is, quite simply, the proverbial dragon's hoard when it comes to references, both historical and mythological. The creators have dipped heavily into Welsh Prydaic myth and Arthurian legend, as well as "The Chronicles of Prydain" by Lloyd Alexander (a series of five books that remain, to this day, among my top ten fantasy reads). There is also a healthy smattering of historical references, from Londinium (the original Roman name for London), to Gaius (based on the Latin name for Julius Caesar). Even the Divine Empire is a reference to the Holy Roman Empire. What impressed me the most about the series is how it plays about with mythology and history to create a story that is both flowing and understandable. The numerous references to Welsh mythology that appear, like Dyrnwyn, Annwn, The Cauldron of Ressurection, amongst many others, are used in an extremely intelligent manner. Even the names of some of the characters are taken from mythology, Arawn, Ogam, Llyr, etc, etc. There's also a smattering of Christianity in there as well, but anyone with half a brain will see those references fairly quickly. If you want a more detailed breakdown of the various references then google it or ask me, but there's too many for me to put down here. Now one would think that having so many references would be an attempt to hide a poor story, and normally I would agree (with a proviso of course). Tears to Tiara, on the other hand, has not only a great story, but also a cast of characters who are pretty damn good overall. The plot is extremely well paced and flowing, and there is nothing that occurs that doesn't have an impact on the progress of the story (although some instances may not seem that way at first). Art and animation are big plus points for the series. Oriental Light and Magic have doen sterling work blending CG and normal animation. The backgrounds are atmospheric, but lack a certain polish on occasion, something which, once or twice, has distraced me from enjoying the show. The characters on the other hand, are extremely well animated, especially during combat. One of the high points for me were the differences in sword styles used in the show, something which was particularly in focus during the "duel" between Octavia and Arthur. As far as the designs go, the anime seems to have followed the path set by the game. This has both advatages and disadvantages, and is the main reason why I'm of two minds where the design is concerned as all too often the original template needs some updating. The advantageof using the original character design is that no time is wasted envisioning the characters, but the disadvantage is that the show lacks a certain creativity because of the inherent limitations from using this method. The music is very well done throughout the series, in particular during several scenes where the choreography between visual and aural is superb. Unfortunately the same cannot be said of the OP and ED. The OP is a nice enough J-Rock track called "Free and Dream" (sung by Suara), and is nicely choregraphed, especially the metaphor where Arawn and Arthur share an apple while fighting back to back. My problem with it though is that it's a bit too "boppy" for my tastes. That doesn't mean it's not suited to the show as it does have a hopeful and joyful feel to it, it's just that given the theme of the series I would have preferred something a bit more in tune with the overall atmosphere of the show. The ED, "True Sky, Blue Sky" (sung by Aira Yuki), on the other hand, is pure J-Pop and it really feels out of place given the nature of Tear to Tiara. The cast used for the series are noteworthy in that they are also the same voice actors used for the PS3 game. I actually applaud this move as rather than bringing in new actors, the producers have stuck with people who are already familiar with the characters. This actually shines through with the quality of the voice acting as the cast are able to really sink their teeth into their respective roles, something they were only able to do in a limited fashion before. Granted there are one of two annoying voices in the crowd, but the series is well served on the whole because of the experience of its cast. The characters actually represent something of a quandary for me as I'm familiar with the mythic and histroical usages of many of the references. Because of this I have a slightly different take on them than most, especially those in the lead roles. Out of all the cast the one who really stands out is Arawn, and the one thing I most liked about him is that from the beginning of the series he is a complete character. Much of the development occurs on the part of Arthur, Rhiannon, Morgan and Octavia, and whilst the girls may be sporadic with their growth, Aruthur is coninually pushed by Arawn. In essence, Arawn (and Ogam to a degree), play the father figures to the humans, and it was nice to see the producers acknowledging this by allowing the viewer to understand the reasons behind Arawn's actions. I actually found myself liking most of the characters in the series, even the Fairies. There isn't any single character who I would call truly annoying as, for the most part, the characters spend much of their time on edge. This is an extremely good fantasy anime that may appeal to fans of Fate/Stay Night (because of the Arthurian references), as well as to fans of Arthurian legend, Celtic myth, or even Roman History. The pacing and style of the series, together with it's numerous well used references, make this one of the better fantasy anime I've watched. Now why can't all game based stories be as creative and enjoyable as this one? I saw good reviews and thought this series was exactly what I was looking for. An RPG style sword and magic adventure. While it has action and a good plat/storyline.... the characters are boring and repetitive. The episodes are always broken up by long and needlessly drawn out conversations. Practically a visual novel. The art style is pretty good, the outfits and landscapes looked great. Fight scenes were nice and bloody. However the background music was very repetitive throughout the series, the same three or four tunes that were straight out of a 1995 RPG game. Almost as annoying as the dialogue. The word 'Mamoru' is permanently scribed into my brain. "This guy killed my dad so I have to kill him! ah but wait, he's my friend! I totally forgive you now that I think about it, you're not such a bad guy." Give me a break. I honestly got so annoyed listening to these characters talking that I skimmed through the last 5 episodes just to see how it ends. Which was typical and boring. Not such a bad series, but 26 episodes is far too much for the content within it. If you're into the hearing 'blah blah blah protect my friends' and 'blah blah sacrifice myself blah blah' over and over, dive right in. CHARACTER'S MOTIVATION. Frankly, the motivation of the characters in Tears to Tiara was a cliche. I'll give you a hint, "mamoru" is a big key here and for otakus, this key word "mamoru" is very redundant because it's used in many of the animations currently distributed today to provide characters a motivation. CONFLICT. I like the fact that the only conflict mentioned in the series is not restricted only to the Holy Empire. FASHION. Although Gael is a group of a less developed native people, I believe that their sense of fashion was awkward when I had my eyes set on them. For instance, Arthur shows his abdomen, in current fashion, that's considered extremely awkward for males to dispose their abdomen despite wearing a shirt, but the animators sense of creativity that they put in to make the awkwardness contribute to the idea of their primitiveness. As for the Holy Empire, Gaius wore the Romanian military uniform. Although, it's not original, his fashion clearly showed which era and country he comes from and clearer symbol he reveals about himself. VIOLENCE. I believe the violence wasn't too extreme. Since the setting of Tears to Tiara is set in the medieval times, only swords, bows, catapults, spears, shields, arrows, and hammer are involved. There aren't many limbs cut off from sword fighting or beheading, but there are definitely scenes where blood is spilled when two sides cut one another to defeat their enemies. THE BGM. The intense music mainly supported by the strings and bass sounds, created the intensity of a bloody battle. VOICES. Arawn's seiyu depicted a good example of his haughtiness, and Ogam had a low pitch voice which gave the idea that he is a normal humble old man. However, Riannon's moe voice of Goto Yuko do not match her charisma of Gael's female chief, even if it was provide her immature characteristics. The opening did not contain too much rock or hip hop characteristics making it so that the time setting set by the music does not upset and interfere with how the actual time setting the story should be set in. The first ending, blue sky true sky, although the ending of how the little girl running shows the entire cast of the story, I didn't like the fact that the girl running there gave spoilers. The ending did contained some energy to make the viewers still lively and be disappointed by the fact that they reached the ending. Moreover, the beat was allergro (120-168 bpm) making it a very fast and bright piece of music. The second ending, weeping alone, makes a considerable contrast compared to the first song because it's a bit sadder. Since this story consists of violent scenes and would obviously have some mourning scenes, it was wise for the creators to create a song of a bit sadness to create a grieving mood. I believe that the names of each character gave away too much about what each of the character's roles were and what the next consecutive events would take place. Which takes away too much of the fun to predict what the next episode would occur. For instance, the protagonist Arthur's name and his personality clearly gives away the name of the famous British epic hero.Nonetheless, the exaggeration of the epic heroes made by myths and legends does not become the characters; they still form their realistic characteristics. I've enjoyed the series because it had a very witty method of using the names of other Welsh, Christian, Roman, Greek, British, Latin and other cultural names to produce some form of symbols for the characters. For example, the 12 white spirits was a clever representation of the arrogant 12 Greek divinities who believes that they are perfect even though they are not. I felt Tears to Tiara was very unoriginal but at the same time unique. What I mean is that the fruits are not unique but when you mix them you get a unique juice: the Tears to Tiara, the juice, was just a story that consisted of popular cultural tales, the fruits. Even though the tales were not their work, the story in which they used the tales to make a very ironically original plot deserves an applause. Tears to Tiara is not so much a spiritual successor to Utawarerumono as it is a remake with a change of setting. Both shows were directed by Tomoki Kobayashi, with the production studio being Oriental Light and Magic. Both are adaptations of a tactical RPG/visual novel game from AQUAPLUS, and while the grand sweeping fantasy story is a departure from most visual novels turned anime, the original creators clearly only had the one diversion from the standard. The lack of originality here is frustrating for anyone who has already seen Utawarerumono. Nearly the entire ensemble of characters immediately draw comparison to counterparts in the other show; and, more damningly, so do plot points and twists. The general plot of the story revolves around the Demon King Arawn becoming the leader of the small Gael clan, first leading them to fight off a malevolent Divine Empire,, then eventually to stop the corrupt gods that seek to destroy the world. The story is standard fare as RPGs go, even without comparison to its predecessor. Unfortunately, beyond even the uninspired narrative, Tears suffers from awkward pacing: on multiple occasions, apparent looming conflicts with the series most regular antagonist are ignored for multiple episodes in order to explore other sub plots or character arcs that sprout inorganically from the main story. Even worse, the transition of the primary antagonist from the Divine Empire to the corrupt deities known as the White Spirits is jarringly abrupt and lacking the world building necessary to properly convey the escalation of danger. The underwhelming story might be forgivable had the cast been entertaining or endearing; they are almost uniformly neither. While Arawn is an improvement over Hakuoro as a protagonist, on account of starting off with much more personality thanks to an absence of amnesia, he is probably the only of Tears' characters that are a clear improvement over their precursors. The next most important characters, Riannon and Arthur, are adequate as the romantic interest who's a reincarnation of someone from Arawn's past and a tediously honor-bound warrior and future leader. With the exception of Ogam, who fills the standard wise old sage role, the remaining cast are so devoid of personality that some of them don't even warrant a stereotype, defined only by a recurring “joke” and the weapon they wield. One pair of characters get a scene about two-thirds of the way into the show presenting them as a longstanding tsundere-admirer relationship, despite having no interaction prior. Such an incident demonstrates that the anime is simply ticking off a checklist of expectations rather than making a genuine effort. Not helping the character depictions is the dub. The translation is clearly attempting to be grandiose and noble to fit the story's epic scope, but instead comes across as trite and overblown, especially when the subject matter turns to power of friendship or honor speeches. Further complicating the acting is the effort to give many of the cast Gaelic accents, which in seems to make it more difficult for several of them not to speak their lines in a grating squeak (Greg Ayers' Negi Springfield voice is back, for example). The animation is thoroughly average, although absent is the conspicuous CG from Utawarerumono used in the large battles. The trade-off for the more consistent look is that the fights are scaled down, which hinders the scope of the story. At least the character designs are appealing. If you really want a mythic fantasy adventure where the protagonist leads an oppressed people to freedom and survival, watch Utawarerumono instead. 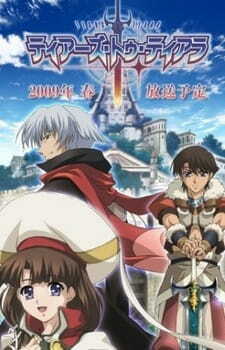 If you already have, there's not really a need to watch Tears to Tiara. Seven days of the week, seven songs from anime openings to make each one of those days a little happier and sunnier.